A gorgeous blend of two-tone pink hydrangeas. 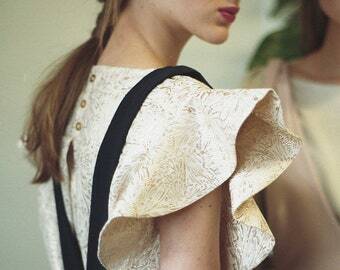 Handmade with artificial hydrangea mix of pink flower colors on a natural grapevine base. 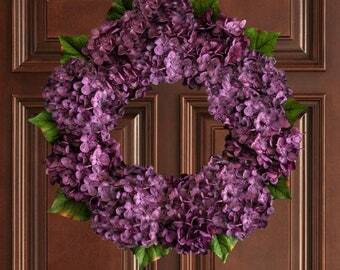 • 6 Hydrangea Wreath measures 15-16" overall diameter and 5" deep. 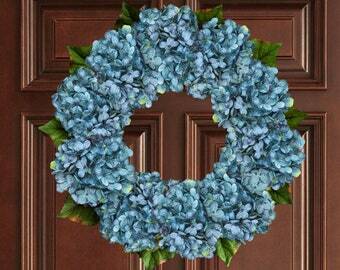 • 9 Hydrangea Wreath measures 19-20" overall diameter and 5" deep. • 12 Hydrangea Wreath measures 22-24" overall diameter and 5" deep. This wreath purchase comes with a complimentary door wreath hanger. A heavy duty thin metal door wreath holder coated with a black color finish, or White color finish. 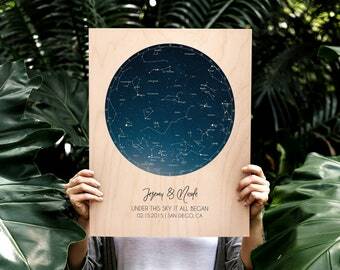 Measurements are 7/8 inch wide by 12 inches tall. 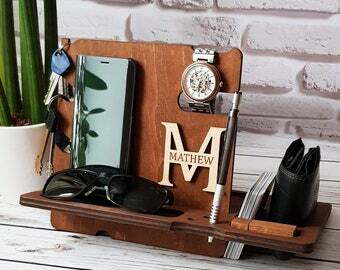 Use for inside and outside doors. 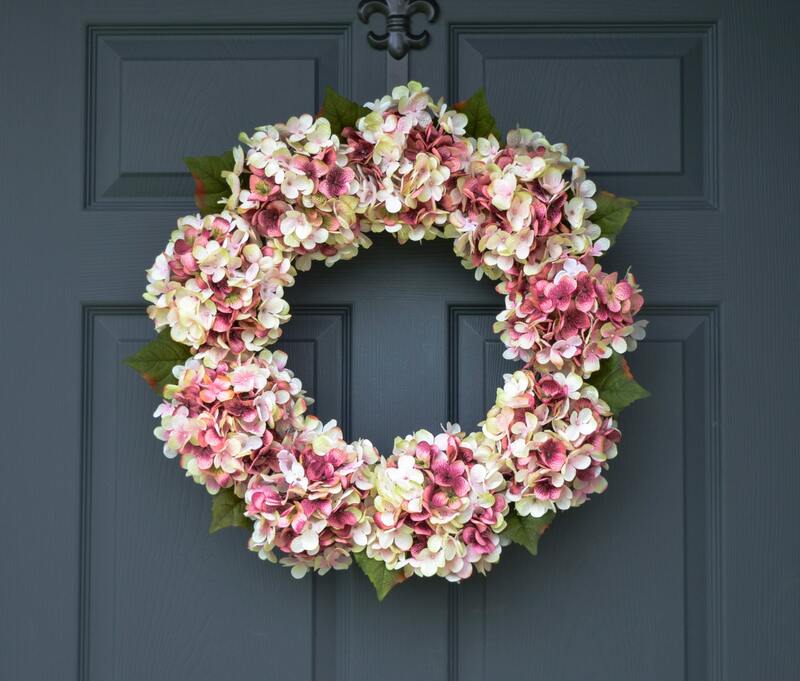 This wreath purchase comes with a complimentary upgrade option for UV spray clear matte coat protection applied to the artificial wreath flowers to help guard against premature fading from UV light rays from sunlight. The wreath looks amazing on my door, it looks perfect, I’m so happy with it. I with I had more doors so I could order more wreaths. And it was in perfect condition, very well packaged. 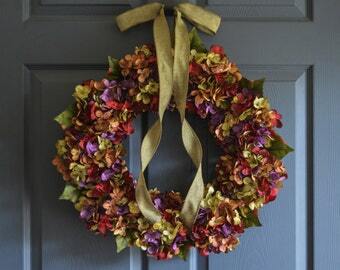 Does the wreath include the ribbon in the picture? Yes, if the wreath photo shows the ribbon, then the wreath will include that ribbon. 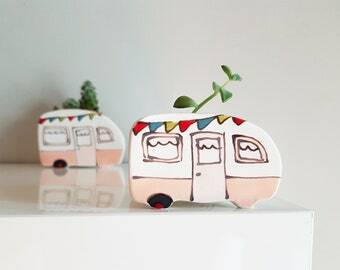 Is the Free Wreath Hanger the ribbon in the picture? The free wreath hanger is a metal hook that attaches easily to your door to display your wreath. Do you offer discounts for a multiple wreath order? How long will my wreath last? My returning customers tell me they have displayed their wreath for 5 years now, and the wreath looks fabulous. 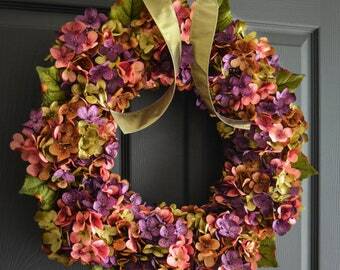 A high-quality wreath from HomeHearthGarden has proven to be a great investment!